Yesterday, I got the cast off from my ganglion excision surgery. Felt like an eternity that I was stuck with it, but in retrospect it wasn’t so bad. Getting the cast of was kinda fun. I thought they were just going to unwind me luck a mummy. Forget that. They just whipped out some bypass scissors and hacked it off in a few seconds. Guess I’ll never know exactly what material the support in there was driving me nuts was made of; it was laminated in cushioning. 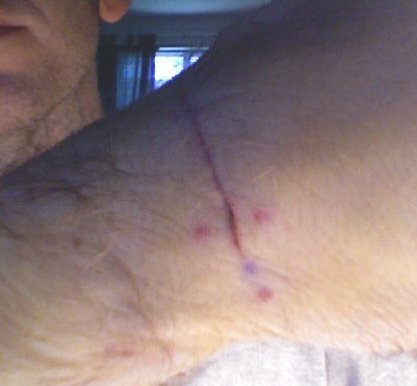 Then I got my first look at the incision itself. Man, that’s quite a bit bigger than I thought it would be. 2 stitches, but the length-wise one was pretty long. I though it was gonna hurt when they pulled it, but a couple of snips and a little pinch later, it was over with no big deal. With that, the nurse pointed me to the sink and said to give my arm a good scrub down. Man, that felt really weird. The nurse then gave me a brace and said to hang out for a few minutes for the nurse practitioner to give me a going over. The practitioner said to where the brace all the time (except for showers, duh…) for another 2 weeks and then come back in for another follow up. She was also nice when I bugged her with all my questions about running and typing. The former as 100% ok (phew! ); she even asked if I was doing the Mountain Goat (more on that in a second…). The typing was fine too, in moderation. If I started to get any pain, to just lay off for a while. Man, a load off my mind. So, I just got back from my 1st Marathon group run. I’m extremely happy to report that wrist didn’t bother me at all in my 30 minute mini-run. I was really nervous that the brace would irritate the area, but it was just fine. I was also kinda scared that I’d forgotten how to run after 12 day break. The weather was beautiful and I felt great. Could have easily run for hours today, but thought it better to save myself for the Mountain Goat, tomorrow. Yep, I’m gonna give it a shot. In fact, I’m heading down to the expo to register now.